This restaurant in Toronto is just the most fun. Japanese restaurant with either the sushi bar or teppanyaki. 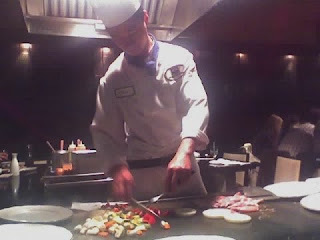 Teppanyaki is where you sit around the griddle and a cook chops and prepares the food right in front of you. 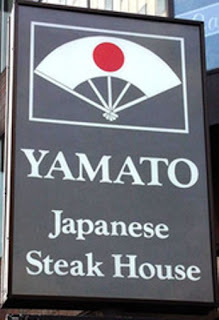 YAMATO is located in Yorkville in Toronto and is such a fun spot! There are about 20 seats in a horseshoe shape surrounding two griddles with two chefs! The chefs put on quite a show when cooking your food, and it is truly hilarious to sit with complete strangers and eavesdrop on their conversations. You are generally in for quite a treat! The food is amazing, make sure when you order a teppanyaki dinner you asked for fried rice instead of steamed rice. It is the best rice I have ever eaten. After the make your fried rice there is usually some crusty bits left on the grill, make sure you ask your chef to give you them - it's like a little crut left over! YAMATO has teppanyaki dinners like the normal chicken terriyaki or beef terriyaki, but they also have things like shrimps or scallops in a garlic-butter and soya sauce. The best dish though is the Imperial - a combination of sirloin and lobster. The dishes are quite large so I recommend sharing a plate with a friend or date, but ordering two orders of fried rice! Also - the lychee martini's are a great drink they serve. I definitely recommend starting with one of these! Have fun at YAMATO!